The Si827x isolators are ideal for driving power switches used in a wide variety of power supply, inverter, and motor control applications. 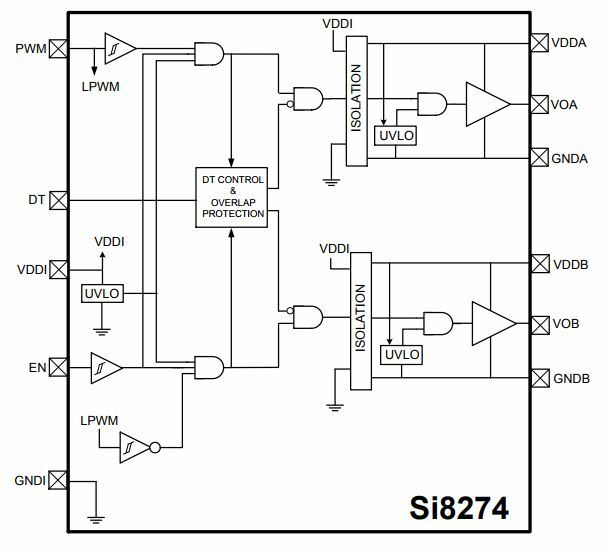 The Si827x isolated gate drivers utilize Silicon Laboratories' proprietary silicon isolation technology, supporting up to 2.5 kVRMS withstand voltage per UL1577 and VDE0884. This technology enables industry-leading common-mode transient immunity (CMTI), tight timing specifications, reduced variation with temperature and age, better part-to-part matching, and extremely high reliability. It also offers unique features such as separate pull-up/down outputs, driver shutdown on UVLO fault, and precise dead time programmability. The Si827x series offers longer service life and dramatically higher reliability compared to opto-coupled gate drivers.